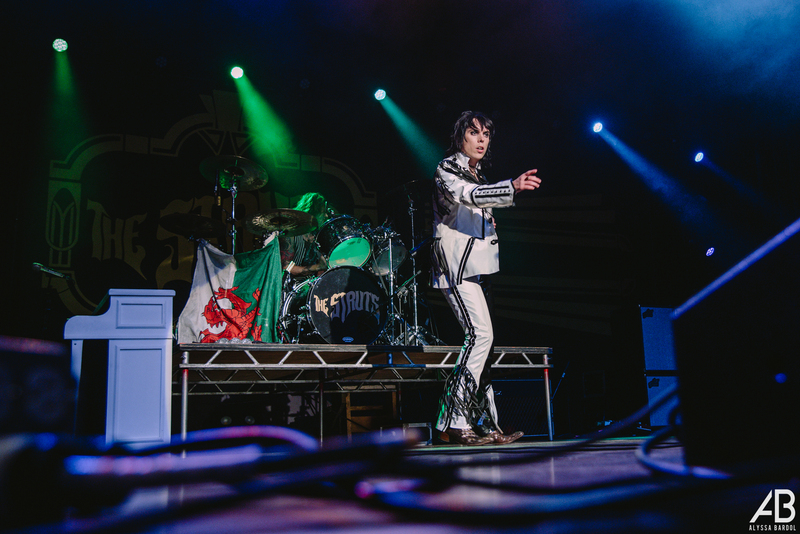 English glam rockers, The Struts, came through The Pageant last night on the heels of the release of their second sophomore album, Young & Dangerous, set to release this Friday. The stop came as part of their current North American run, the “Body Talks Tour,” which features support from Spirit Animal and White Reaper. In charge of kicking off the night was Brooklyn-natives, Spirit Animal. Best known for their hits “Regular World” and “YEAH!”, vocalist Steve Cooper has an energy that is both unexpected and infectious. Their style seems to draw from a fusion of The Talking Heads and Red Hot Chili Peppers, but their electronic modulation offers a modern and unique twist on that rhetoric. After the band exited the stage, Cooper took to their merch table to sell shirts, CDs, and take photos with a multitude of fans that formed a line longer than The Struts’ table. Needless to say by audience reaction alone, Spirit Animal is a band to watch. With the energy on the rise, White Reaper took the stage next. The five-piece garage punk band from Louisville, KY, has been touring since the release of their last studio album, The World’s Best American Band, which was released in 2017. The band was well-received by the crowd, but offered a more tame stage presence than Spirit Animal. Instead, they were technical and lived up to the genre name of “garage punk” by making the show feel intimate and small. The band jammed through 16 songs in total, including requests from fans, a Bruce Springsteen cover, and new material that will be released on Friday as part of their new full length release. Toward the end of their set, Spiller traipsed about the stage asking for a fan volunteer to come up and sing with them, ending with bringing a young boy named Xavier to the stage to, as Spiller said, transform into a rockstar. That he did, as he joined Spiller in hyping up the crowd and then taking an epic bow at the end of the song. Although I haven’t experienced the famed 60’s and 70’s British rock shows myself, I can only imagine that The Struts have reincarnated the same energy and nostalgia as those legendary times for rock music. Their energy, so unique and passionate, leaves the crowd with no question as to if they’d rather be anywhere else than right there in front of them, jamming along on their instruments. Perfectly showy, theatrical, but still remaining gritty and down to earth, The Struts are the perfect depiction of what modern rock could – and should – aspire to be.